At Shimansky, we encourage you to speak your mind and walk out with a ring that not only represents your love, but your distinctive style as a couple. We welcome you to bring your own design, choose your own diamond and be part of the creation. Our group of designers will be happy to talk you through the process. We also offer the opportunity for you to write a very special and personal message on the diamond and the ring. This way your choice of an engagement ring is truly unique to your love. There will be no doubt that she will cherish the personalised message forever. If a minor adjustment on one of our designs is all you need, consider it done. At Shimansky, we understand that every single detail counts. Ultimately it’s all about creating a masterpiece that you and your loved one can connect with and that will seal your love forever. You’re also welcome to take a bit of inspiration from our unique Shimansky collection. We offer a wide variety of engagement rings in our stores. Whether it’s an elegant solitaire diamond, a three-stone trilogy or a unique design, you are certain to find the perfect Shimansky diamond engagement ring that suits your style and reflects your love. In the end there’s no limit when it comes to your love. 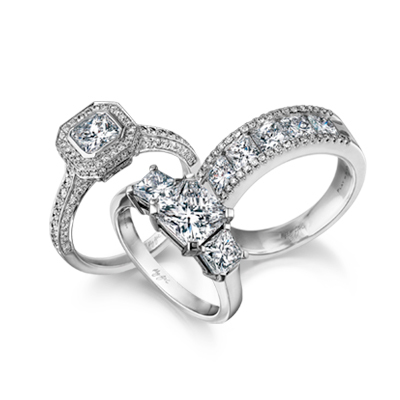 View our in-house engagement rings and select a ring for that special woman in your life.